There are few truly magical things in this world that are practically free. 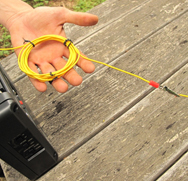 This DIY AM antenna is best used outdoors but you can make it work inside by somehow re-routing the wires. It amplifies all weak AM signals, so a powerful local station might be heard over your entire AM radio dial.